Un livre complet sur les bases de la teinture végétale, par Jenny Dean. The glowing yellow of goldenrod, the warm brown of walnut shells, the pale green of birch leaves … all the colours of nature delight the eye. To create an infinite variety of beautiful natural colours on wool, silk, cotton and other yarns and materials you can use a host of flowers, leaves, barks and roots, from dahlias and safflower to onion skins and turmeric. Expert dyer Jenny Dean shows you how to dye at home using simple equipment. There is helpful advice on the mordanting process that will fix the colour, and guidance on light-fastness, plus instructions on how to use traditional dyestuffs such as woad, indigo, weld and madder. 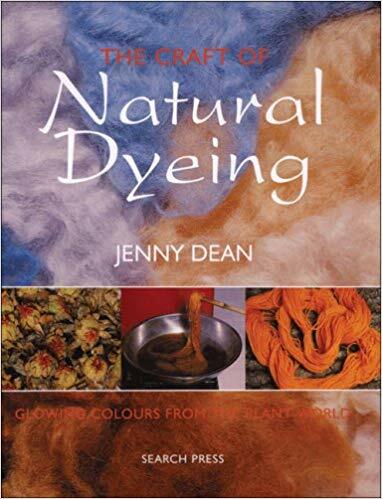 For the true enthusiast, there is a chapter on growing one’s own dye plants, but even the first-time dyer will be captivated by the rich effects obtainable in the world of natural colour.